← We’re 14 months old! This week, a truly magical thing happened – the clouds parted and the sun came out. It was orange, warm, and much needed. People started smiling to each other as they had their first taste of spring. It really couldn’t have come at a better time. Not only are we all just sick to death of winter and snow, but last week was hard for me. I looked at adaptive equipment for the house for Ella. A bath chair and chair for her to play in. The vendor brought these massive things, and my immediate reaction was: No. Just no. She doesn’t need these. She won’t need these, no. But, I don’t know if she will. Her OT could definitely sense that I was super uncomfortable and we’ve talked about finding some other things that are smaller and less expensive. Who knew that a chair for your house could cost $4000?! I mean, they should partner with Apple for over pricing products. Then, I got Ella’s accessible parking permit. It’s weird seeing it just sitting on the front of my car. It’s slightly like a punch in the gut, but also a reminder of how far she’s come. I’ve been filling out constant paperwork for her as well and it seems like it’s never ending. And then, the sun came up. The girls are having pictures done Thursday and I wondered about Ella since she can’t sit on her own and laying her on the floor will not work unless people want to see shots of Raegan using her like a jungle gym. So, I thought of the Bumbo. I tucked it in the basement months ago because the girls were both arching their backs trying to pop out. I thought I’d at least try to see if it could work, and it was like the sun came up right in the house. 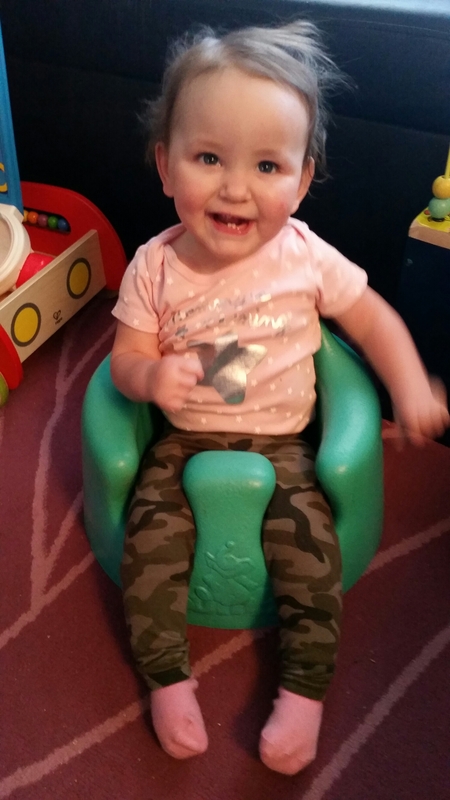 Ella’s face beamed and she was so excited to be sitting up, on her own! It’s not a sustainable chair but it works for a little time so she can play with her sister, something I’ve wanted for so long. Spring is ten days away (and also the girls’ due date), but it already feels sunnier, warmer, and lovelier. Now that's a happy face! Ella is so excited to play with her sister! 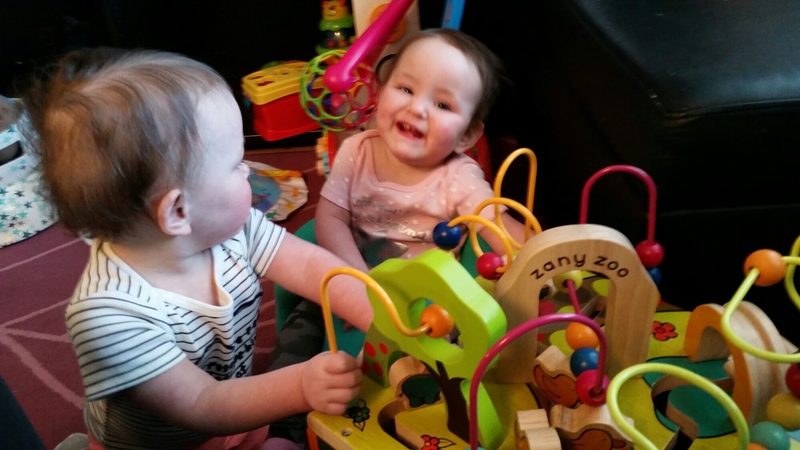 This entry was posted in Baby love, Home is where the heart is, Mamahood and tagged cerebral palsy, identical, momo, mono mono, NICU, preemies, special needs, toddler, twins. Bookmark the permalink.